Today I’m including an excerpt from my new book, Stepparenting With Grace: A Devotional for Blended Families. The book releases August 7th with Worthy Publishing and is currently available for pre-order! 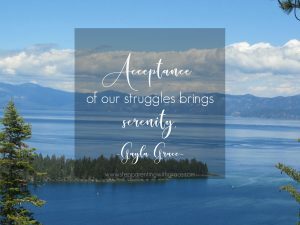 Thought for the Day: Acceptance of our struggles brings serenity. Acceptance provides the key to contentment and an anchor of stability in the midst of trouble. We find serenity when we stop fighting the challenges of life and accept adversity without grumbling. 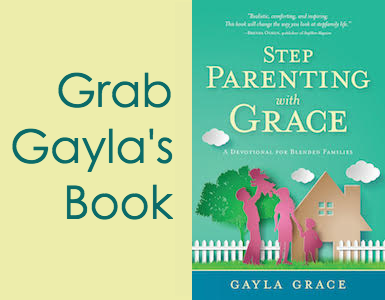 What are you struggling to accept in your stepfamily? Disharmony? Lack of unity with your mate? Uncomfortable feelings? Loyalty bonds to the other home? Acceptance recognizes the reality of our situation without demanding control of the variables. It allows us to quit insisting others change. We let go of our need to have everything our way. Acceptance doesn’t mean we give up on our hopes and dreams, but it maintains a perspective of the present that offers a better understanding for the future. We find a story of acceptance in the book of Job. The author introduces Job as a “blameless and upright” man (1:1), and we would say that Job doesn’t deserve the difficulties he’s about to experience. Within the period of one day, messengers report to him the loss of his livestock, his servants, and his ten children. His response amazes me, “He fell to the ground in worship and said, ‘Naked I came from my mother’s womb, and naked I will depart. The LORD gave and the LORD has taken away; may the name of the LORD be praised.’ In all this, Job did not sin by charging God with wrongdoing” (Job 1:20-22). Job went straight to acceptance. I’m certain my response would have been different. Too often, I complain. I question. I search for answers. Acceptance means we name our problems and embrace our struggles. We no longer insist on immediate solutions or demand complete understanding. Instead, we take our problems to God and lean on Him as we wait for answers. That’s when we’ll discover contentment in the midst of our difficulties. Acceptance doesn’t mean we give up our hopes and dreams. It means we name our problems and embrace our struggles. I don’t like the struggles of stepfamily life, Lord. I need Your help to accept they’re part of the journey I’m on. Do you struggle with acceptance? How have you learned to embrace your struggles and take them to God? I’d love to hear about it in the comments. I respect your privacy and will never share your information with anyone else. Rarely will embraced struggles have this outcome, and I truly do know how blessed I am- my stepson’s mom and I spent the other evening together at a tattoo shop where she got the tattoo of our little family (my husband, me, stepson, and his mom, in a heart-shaped entwined arms figure) placed. The tattoo that I envisioned and my brother’s husband drew for me, that I had inked on last year for my birthday. God can bless us beyond measure when we sincerely pray for His will to be done in our messy lives! I never would have guessed He would do all of this and I give Him the glory at every opportunity! Practical tips, encouragement, and new resources delivered each quarter. 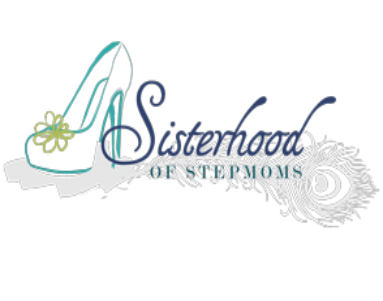 Also receive my FREE ebook, Stepping With Purpose, a collection of personal stories from seasoned stepmoms. Some of my links are affiliate links, which means I receive a small compensation if you purchase the product. The compensation, however, will never influence the content, topics or posts made in this blog. I only link to products I have used and personally recommend. 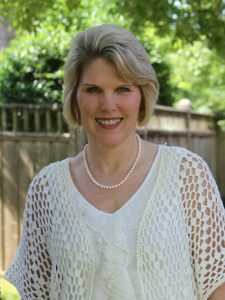 Devotions that provide companionship, encouragement, understanding, and biblical insights from a veteran stepmom. 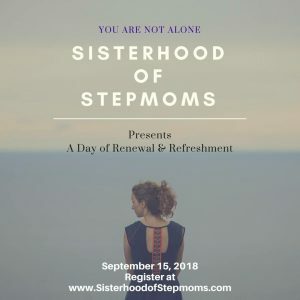 Join a community of stepmoms and find help, healing and hope in the stepmom journey. © GAYLA GRACE. ALL RIGHTS RESERVED. | HOSTED AND MANAGED BY FISTBUMP MEDIA, LLC. for practical tips, encouragement and free resources! 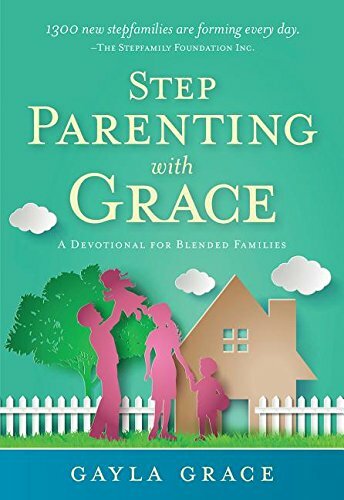 You will also receive, Stepping With Purpose, a collection of personal stories from seasoned stepmoms that will inspire and support you in your journey. You've successfully subscribed. Thank you!